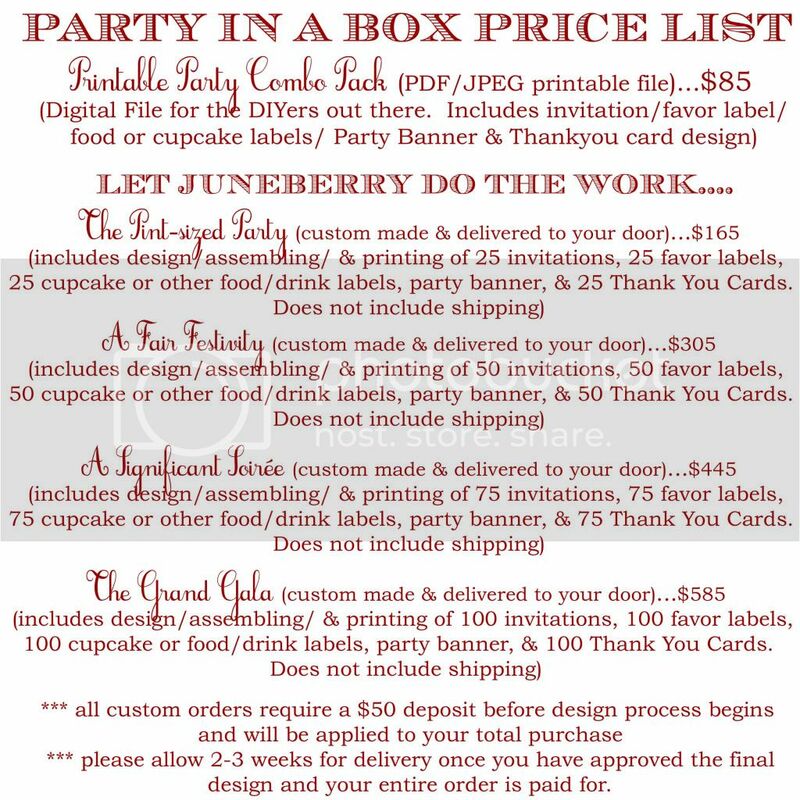 Juneberry Lane: FROSTED: A Delightful Array...Of Desserts Made In A Tray!! FROSTED: A Delightful Array...Of Desserts Made In A Tray!! This past weekend my husband and I decided to clean out our kitchen to make some room for all of our fabulous shower and wedding gifts that we received. I usually dread cleaning out the kitchen as it always makes me realize how much of a kitchen utensil and appliance hoarder I am. While emptying and wiping out cabinets I usually find quirky baking accessories (such as: eccentric cupcake liners, random piping bags, and several bottles of the same shade of food coloring) and forgotten cooking supplies (like: two extra knife block sets, my George Foreman grill from college, and more oven mitts and aprons then I know what do with). But while cleaning out one of our drawers I came across two sets of ice cube trays that my husband and I used in our refrigerator several years ago at our old rental house. We now have an ice cube maker, so I was just about ready to toss them into the trash when I remembered all of the variety of different fruit and herb ice cube recipes that I have seen throughout sites like Pinterest and Facebook. So after a good hard scrubbing I decided to keep them...and I am SO glad that I did! 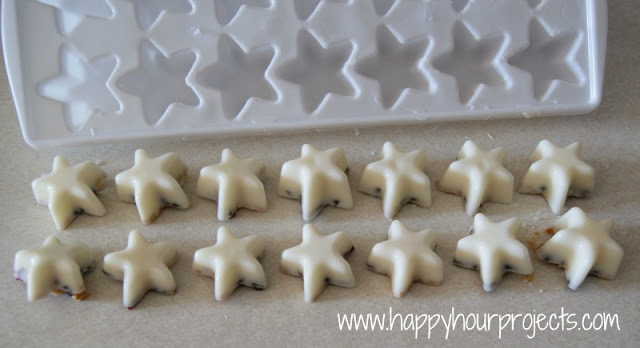 After searching for some frozen lime cubes to put in my husband's Gin and Tonic, I stumbled across a recipe on how to make chocolate candies in those unused freezer trays. I continued researching and found a variety of different ways to satisfy that sweet tooth, while recycling this old piece of kitchen equipment. Who would have known that you could make dessert in ice cube trays? 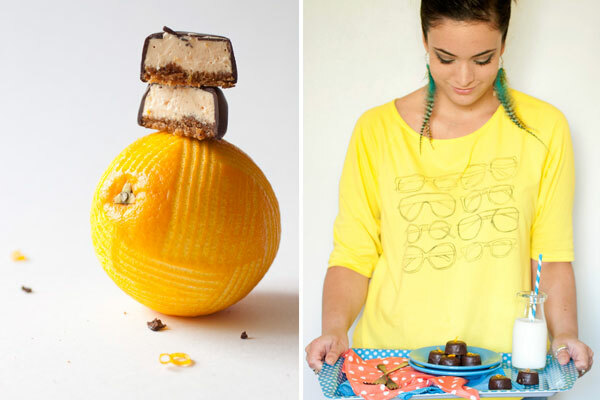 Now try a taste of these tempting treats that will have you wondering why anyone would use their ice cube trays for anything but sweets! 1.) Combine fruit and 2 Tablespoons of sugar over medium-low heat in a small saucepan. Cook, stirring occasionally, for about 3 minutes or until mushy, but not quite liquid. 3.) Mix heavy whipping cream or milk with remaining 2 Tablespoons of sugar in a small saucepan over medium heat until sugar is melted. Pour on top of set fruit mixture in your ice tray Freeze for at least 3 hours or until completely frozen. 1.) Rinse strawberries and set aside to dry. 2.) 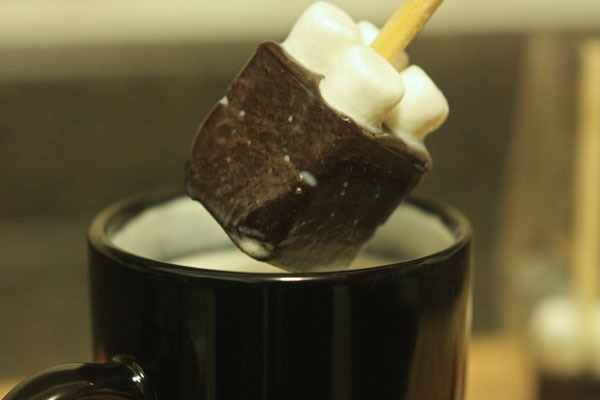 Melt chocolate chips in the microwave, or in a double boiler on the stovetop. Heat until chocolate is melted, and stir until smooth. 3.) 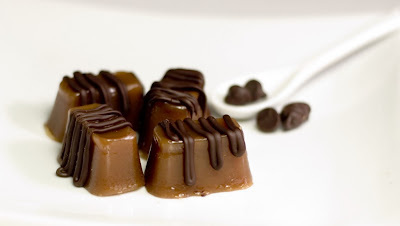 Fill each ice cube slot about 2/3 full with chocolate. Place one strawberry in each slot. 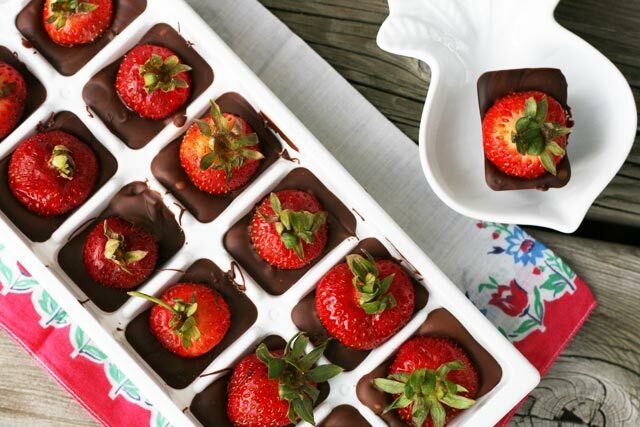 Place tray in refrigerator and chill for at least one hour until chocolate is set. 4.) 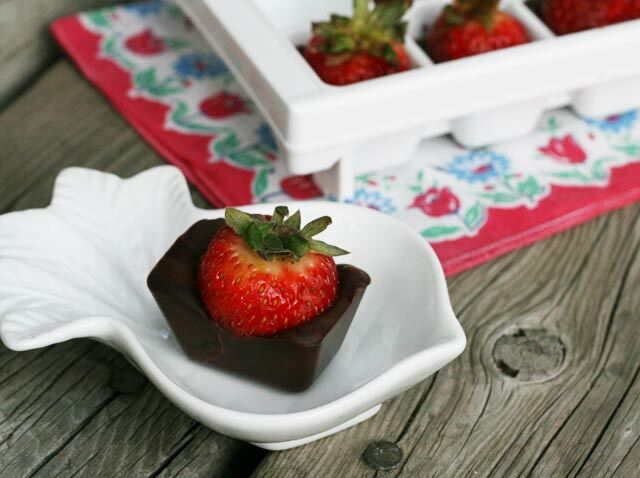 To remove strawberries from tray, simply grab both ends of the tray and turn slowly in opposite directions - just like you do to remove ice cubes from the tray. 1.) In a large bowl, mix together the graham cracker crumbs and brown sugar then incorporate the melted butter. 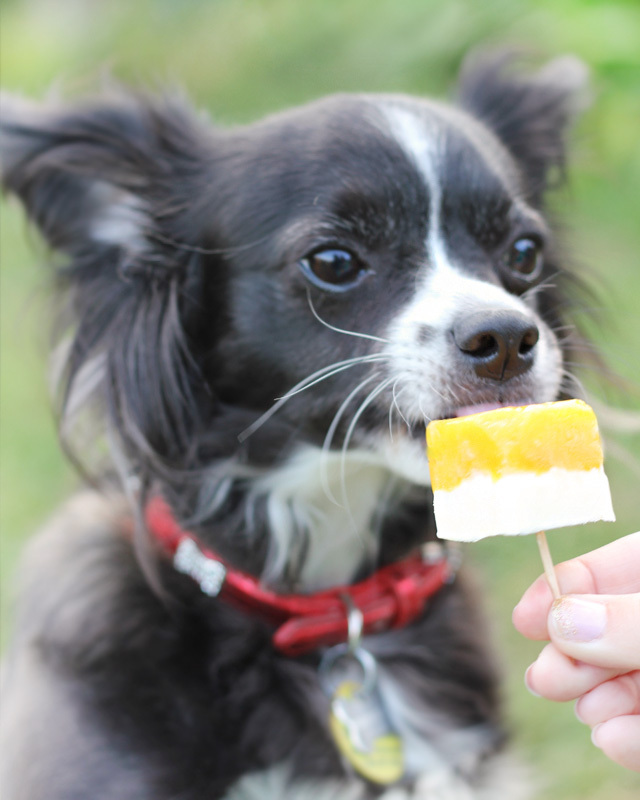 Press evenly into silicone ice cube molds (1 Teaspoon per cube) and refrigerate. 2.) In a large bowl with an electric mixer, cream together the cream cheese, orange zest, orange extract and powdered sugar then fold in the whipped topping until it's smooth. 3.) Remove the prepared graham cracker ice cube molds from the fridge and fill each cube the rest of the way with cheesecake. Let it set in the freezer for at least an hour before coating. 4.) In a double boiler or a heatproof bowl set over a pot of simmering water, melt the molding wafers until they're smooth. 5.) 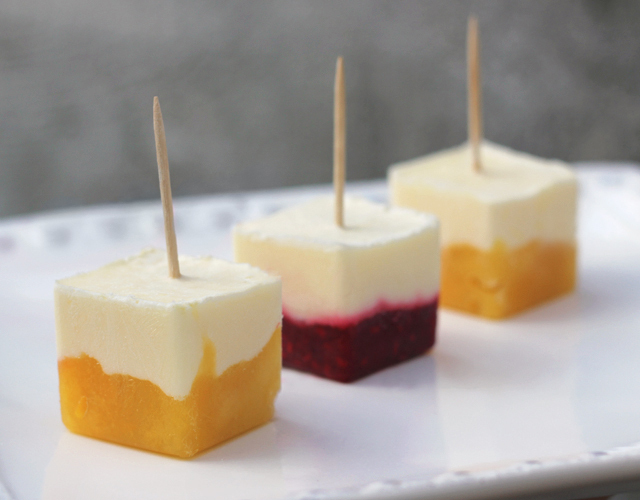 Pop the set cheesecake out of the molds and set them on a wire rack with a plate underneath for easy cleanup. Pour the melted chocolate over each piece of cheesecake until all are covered. 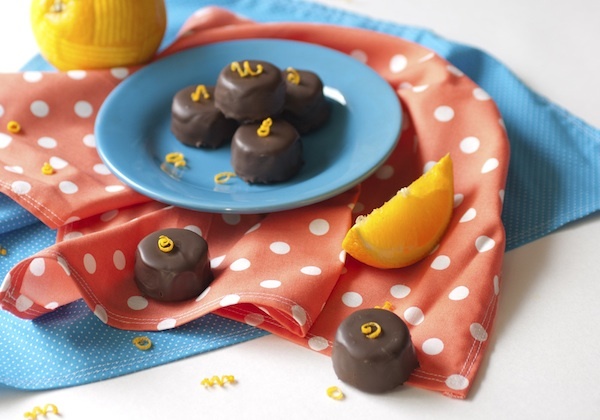 Place a curl of orange zest on top and let the chocolate set. 1.) In a medium bowl, sift together cocoa, powdered sugar, and salt. Set aside. 2.) Chop chocolate into small pieces (no larger than about 3/4 inch long) and combine in a glass bowl that is completely dry. 3.) Microwave in 30 second bursts on 50% power, stirring between each burst, ensuring that your spatula is also completely dry. Once chocolate is about 2/3 melted (there are still some chunks in the melted chocolate), stir until remaining chunks melt. This prevents the chocolate from getting too hot. 4.) Pour melted chocolate into the mixing bowl containing the dry ingredients and stir until combined. Mixture will be very thick, similar to brownie batter. Spoon mixture into a piping bag (no coupler or tip is needed) or into a sandwich bag with the corner sliced off. Pipe the chocolate into an ice cube tray. 5.) 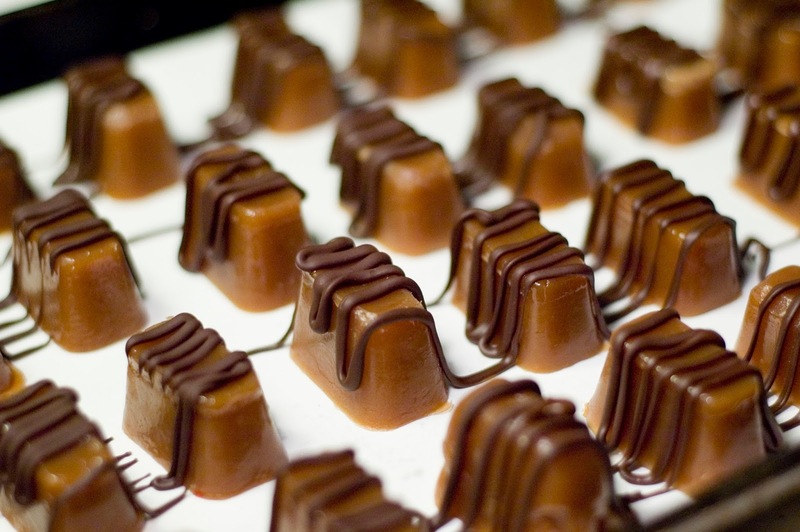 Once all chocolate has been piped, pound the tray lightly on the counter to eliminate air bubbles and to flatten the tops of the cubes if they are uneven. 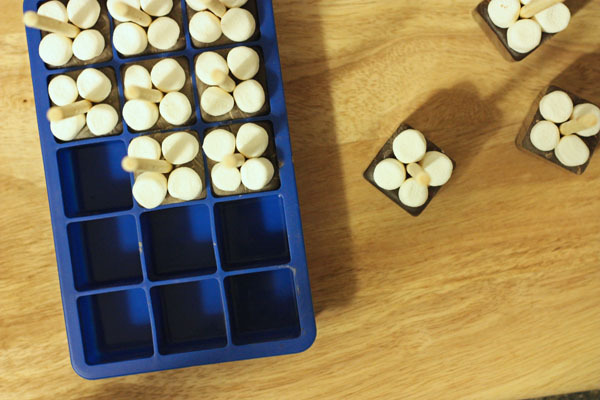 Working one cube at a time, insert a stick and place four mini marshmallows onto the top of the cube. 6.) Once all cubes are complete, set aside until cubes are completely dry. You can also place them in the fridge if you are in a hurry. 7.) Once all cubes are dry, remove carefully from the molds. Wrap pretty and store in the cupboard. 1.) Heat up 1 cup milk (approximately 1 ounce of chocolate should be used for each cup of milk, so adjust based on the weight of your cube) and stir in. Cube will take several minutes to dissolve completely. 1.) In one small sauce pan combine butter, cream, and salt. Bring to a low boil for 1 minute. Remove from heat. 2.) In another slightly larger small sauce pan combine sugar, corn syrup, and water. (**Be cautious while pouring in ingredients, add them all to the middle of the pot. 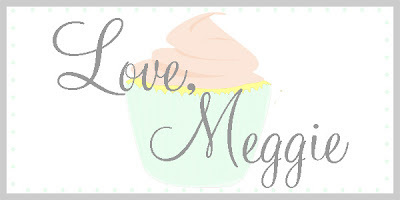 **) You want to be cautious that the sugar doesn’t crystallize/burn on the edges of the pot. Heat over medium high heat until sugar mixture begins to turn brown or an amber color. Do not stir the pan, you can gently swirl the pot to distribute the heat if necessary. 4.) Now here’s when your candy thermometer comes into play. Heat mixture, while stirring occasionally until it reaches 248 F. Once it does, remove from heat and pour into sprayed ice cube trays. I recommend using ice cube trays that had silicone bottoms allowing these to “pop” out easier. 5.) Pop these into the freezer for an hour. 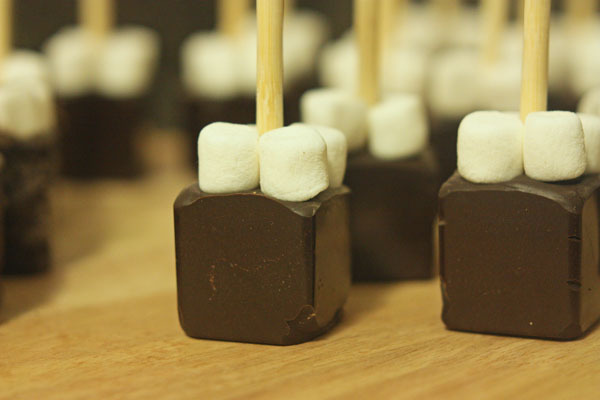 Melt chocolate either in a double broiler or the microwave. Transfer chocolate to a plastic baggy and snip a corner. Drizzle on chocolate however you please. Let chocolate harden in refrigerator. 1.) Stir all your mix-ins together. 3.) Spoon your melted chocolate into the cube sections, or fill empty ketchup/mustard bottles with melted chocolate, and squirt into two ice cube trays. 4.) Cool your bark until it’s solid. If you’re in a rush, you can speed this process up by putting it in the refrigerator, though it’s not necessary – it will harden just was well on the counter. 5.) Then, just pop them out and serve. 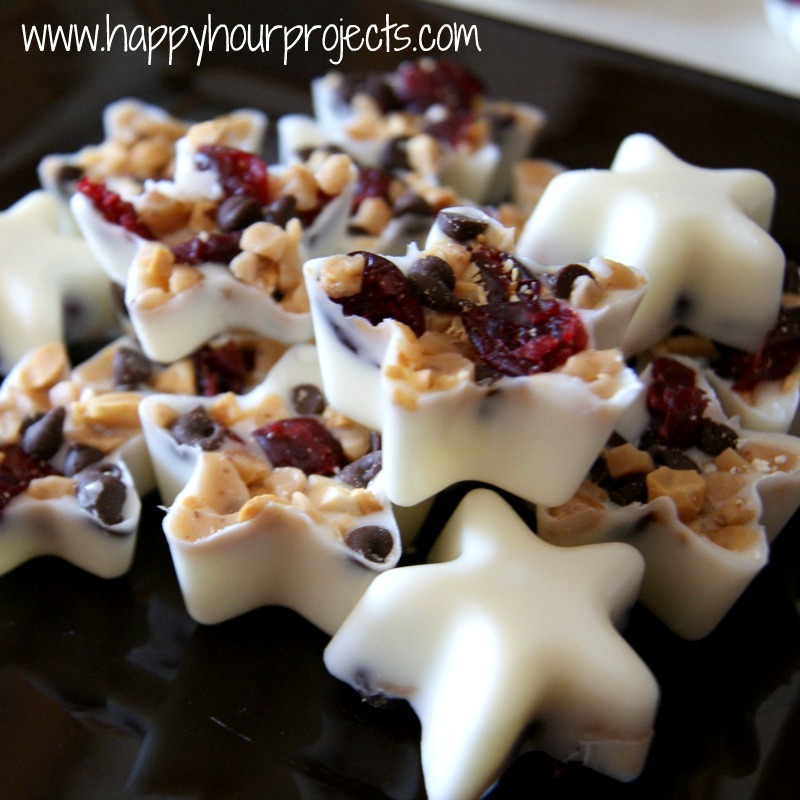 What a simple, yet scrumptious way to create goodies for your next gathering! 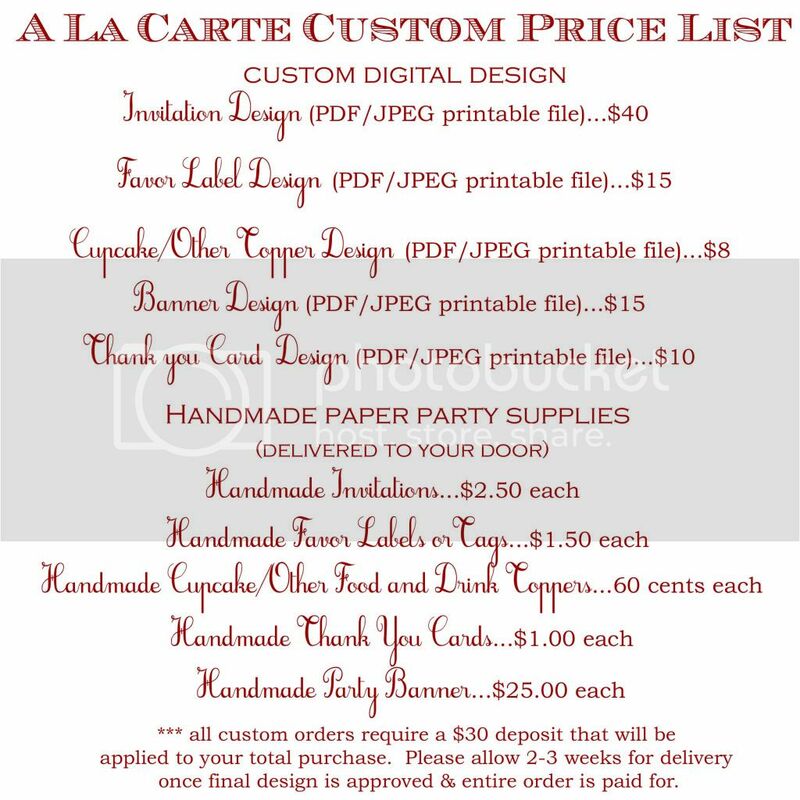 Imagine how fabulous these treats would look displayed in your candy dish at your next holiday party, packaged in patterned candy bags and given as a favor at next shower, or as a decorative touch to the top of a dozen cupcakes or layer cake at your kids' next birthday party. So make a little room in your refrigerator and pop out some of these cube creations that will make you glad you never threw out those leftover ice trays! Have a great week! !